If you’ve never been a dental implant patient before, the concept and process can be confusing and foreign as implants are not what most people think of as day-to-day dentistry. However, implants quickly became the gold standard for tooth replacement after being introduced to dentistry in the early 1980s due to how versatile and predictable they are. Dental implants are made of titanium, one of the most bio-compatible materials on the market, which means even if you have a metal allergy you are still likely to be an excellent candidate for implants. The implant is designed to function as the root of a tooth, meaning it is placed entirely in the jaw bone, as a tooth root is. The top portion of the implant can be a single tooth, a part of a bridge helping to replace multiple teeth, or a component designed to improve a denture or partial denture. 1. No detriment to neighboring teeth: Traditionally, if missing a tooth the dentist would make a bridge. To fabricate a bridge, the neighboring tooth on either side of the space needs to be ground down to allow for a 3-unit bridge (3 crowns fused together that rest on the two teeth) to fit. If those teeth did not need crowns, then they have had a major portion of healthy tooth removed unnecessarily. Bridges set those teeth up for difficulties in the future, such as need for a root canal, cavities in hard to fix areas (you can’t floss between the teeth when fused together), and fracture (we’re asking two teeth to do the work of three, and the supporting teeth have been whittled down). 2. Can look and function like natural teeth: Individual implants mimic a natural tooth better than any other option in dentistry. And unlike bridges, partials, or dentures, the strength of implant biting is often stronger than a natural tooth. 3. Designed to be a long-term fix: Although bridges have been successfully used in dentistry for hundreds of years, they generally shorten the lifespan of the teeth that support them and often need to be replaced multiple times over the years. Implants as we know them were introduced in the early 1980s, which means that our current research is only about 35 years old at this point. Over the last three decades implants have changed some and improved greatly to be very predictable restorations. Because they are attached to a human body, nothing can be guaranteed, but we anticipate implants that are well maintained by the patient to last many decades and hopefully for life. 4. Prevent bone loss and tooth movement: Without stimulation, our bone atrophies and shrinks away. When a tooth is removed, the bone that used to support that tooth will resorb over time creating defects or dents, changes in face shape, and collapse of the cheeks and lips to make the patient appear older than they are. 5. 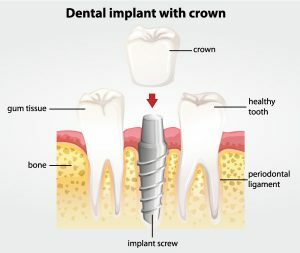 When implants are placed, the forces from chewing are transmitted through the restoration (crown, bridge, or implant-denture) into the bone. These forces stimulate the bone so that it maintains density and volume to support the implant, just as the bone surrounding natural teeth does. Also, our teeth prefer to have partners: if a tooth is removed, the opposing tooth will often grow out of the bone because there is no contact. Teeth will also tip or move forward into areas where teeth are missing which can alter and disrupt proper biting. 6. Versatility: The most common image of a dental implant is one supporting a single crown, but they can be used in a variety of indications. Implants placed in multiples are able to support bridges to maximize the number of teeth replaced with a smaller number of implants. When a patient has lost bone, four or more implants can be placed to support up to a full arch prosthesis that replaces teeth and the bone that used to support them. Partial and complete denture patients benefit greatly from implants, as “snaps” can be placed on top of the implants instead of crowns and bridges. These snaps help the denture fasten in place and provide a major improvement in stability, comfort, chewing forces, and phonetics. A set of complete dentures can only provide about 25% of the chewing forces that a mouth of healthy teeth can. By adding in just two implants at the lower canine positions, the patient improves to about 60% of their previous chewing ability. With every additional implant those forces increase, and the dentures can be designed to be smaller and less cumbersome which also improves taste, comfort, and esthetics. 7. 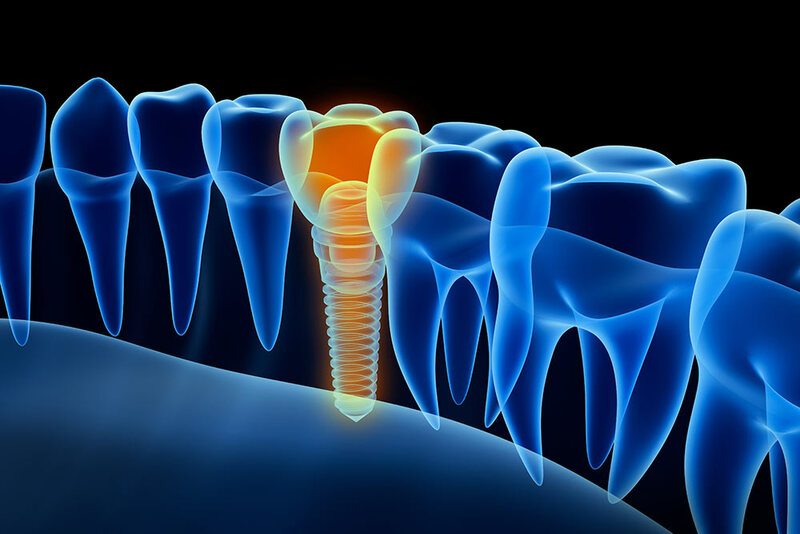 Can be changed or updated: The top portion of the implant can be changed or updated throughout the patient’s life. If an implant was first placed to replace a single missing tooth, it can be swapped out to help support a bridge if nearby teeth are later extracted. If many or all of a patient’s teeth end up being removed, the crown or bridge can be changed to a snap to help support a partial or complete denture. This ability to modify an implant helps the patient to continue to benefit from the implant as they age and indications change. 8. “The entire process under one roof” In many offices, if you need an implant you will be required to travel to outside offices for special x-rays, additional evaluations, the actual implant placement surgery, and multiple post-operative check-ups before you’re able to receive your restoration. Here at Highlands Ranch Family Dental, we understand that our patients greatly prefer not having to go through that ordeal, and we’ve designed our practice so that we can provide every step of the implant process in our office. Dr. Lunn is our implant surgeon who will walk you through every step of the way during your consultation. 3D printing technology is a relatively new innovation in the dental industry. However, it’s quickly gained an immense following and risen quickly in popularity. Today, more and more dental clinics in the United States use 3D printing technology in their work. 3D printing provides dentists, like Dr. Lunn with numerous competitive advantages and allows them to do their work quicker and more effectively. As it has been mentioned above, 3D printing technology is widely used in the dental industry these days. There is no doubt the benefits of 3D printed models in dentist’s work is immeasurable. It is worth noting that 3D printing has a wide range of orthodontic applications. Thus, 3D printing plays a major role in oral scanning. The innovative technology allows dental care professionals to produce bridges, dental crowns as well as stone models quickly and accurately. Using 3D printing technology helps dental care professionals save on time significantly, therefore, increasing the efficiency of the dentist’s work dramatically. Cases and other important patient information can be successfully stored digitally on a computer. So, a fully digital process allows a dentist to get instant access to all of the necessary patient’s data. Another big advantage of 3D printing technology is that it allows dentists to make their work almost painless. As a result, patient’s discomfort is minimized. Obviously, using 3D printing technology helps dental care professionals achieve customer satisfaction.